I'm pretty sure that they have a certain amount of time (10 minutes) and then their turn is skipped and the next team up makes their pick. After a 10 minute wait for the patsies, they would close the draft and start it with pick #33. Really? You don't understand that a nose tackle NEVER gets good stats because they are used to tying up 2 offensive linemen and in keeping the LBers clean. Here is that same data plotted up a different way. There is a saying from Mark Twain. "There are lies, damned lies and statistics". This chart is about WHAT PERCENTAGE of players drafted at a position became starters. IT DOES NOT SHOW HOW MANY, players were drafted at that position in each round. I don't have that data but I'll just use the % success rate and make some observations on that. So, if 3 tight ends were drafted in the first round, 2 became starters and 1 didn't. 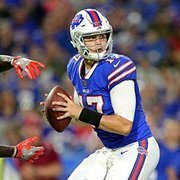 (67% success) If 9 were drafted in the 4th and 9 in the 5th rounds, then one third of them became starters. That is, SIX starters. OR.. to get 2 starters, you would expect to use 6 draft picks in the 4th & 5th. Now let us use some business sense and see how we get the biggest bang for our draft value buck. Cost for a starting TE in the first round? (I'll give you a break and ignore picks 1 to 10, just using the average cost / pick from 11 to 32). 1st round. Spend an average 632 points x 3 and get 2 starters: 632 x 3 /2= 948 points 4th round. Spend an average 71 points x 3 tries and get 1 starter: 71 x 3 /1= 213 points 5th round. Spend an average of 34 points x 3 tries and get 1 starter: 34 x 3 /1 = 102 points. So it is five to ten times more expensive to draft a TE in the first rather than the lower rounds. Can he score so many points that our inability to get off the field on 3rd down on defense disappears? Can he block the DE/EDGE guy that the OT misses and then go out for a 30 yard pass? Sorry, it is not nonsense. No reason to continue this discussion, I think we both agree. Please notice that it is a passing league and running backs are now picked in later rounds. It was more than that. He is fast and a disrupter, but was used as a nose tackle in college. Houston was 8-5 and Oliver played the "0" technique lined up on the center. So he got blocked immediatley and double teamed a lot. He got little help. No DT or DE from Houston is listed in the top 30 (walter football) and the ILB Emoke Egbole, who played behind him, came in at #22. (round 5-7?). He might be, BUT, we are not real strong in the 3 technique tackle he might be playing along side. If we had a real disrupting guy like Oliver there, I think you are right. For the life of me, I don't see how we can draft them both at #9. With Jim Kelly, T.Thomas and Lofton/Reed/Tasker, there were not that many balls left over for the TE. Realistically Oliver or White. 2nd round an offensive tackle or DT depending upon what happened in the first round. You failed to notice that Hockenson's performance was all against linebackers who will probably not make a NFL roster. Film showing wonderful things needs to consider that it shows the performance against relatively slower linebackers who don't react as quickly as the best linebackers. When you watch film, you don't see the absolute speeds but the relative speeds of those players. Yes. I'm an old guy. If you put me in a football uniform and had me run pass patterns against an even older slower guy, I might look pretty good. Be aware of what most nfl rookies say. They can't believe the speed of the pro game. Part of that is speed and part of that is that the players are all smart and instictive. Have you ever considered that: #1 the Iowa tight ends got more catches and more targets then ALL their wide receivers. #2 they mostly were playing against college linebackers who ever will play in the NFL. Look at their schedule last year: and look at when they played against. Here are the best linebackers they played. How will they do when the LB's are smarter and a half second faster in the 40? Using Walter Football college OLB #17 Andre Van Ginkel Wisconsin round 5-7 #18 R. Connelly Wisconsin round 5-7 college ILB #7 Blake Cashman, Minnesota round 3-5 #11 T.J. Edwards, Wisconsin round 3-5 By the way, the success rates of drafted LB making the nlf by round is approximately round success % 3 34% 4 16% 5 4% 6 5% 7 2% Might you suspect that a team who throws more to the TE than all the WR is runnng a gimmic offense? Does that translate to the pros?